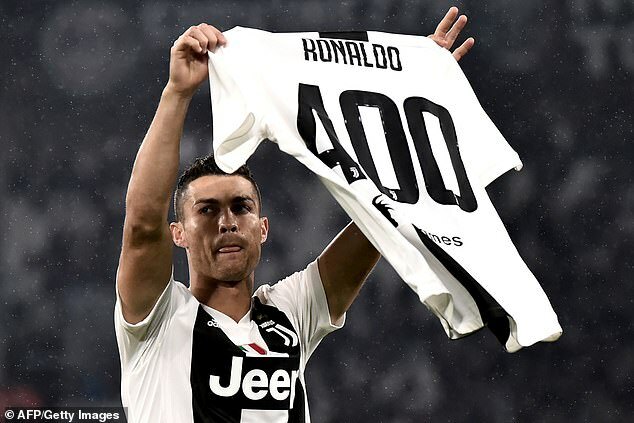 Cristiano Ronaldo was honoured for scoring 400 career club goals in Juventus’ 3-1 win over Cagliari. Ronaldo who came close to scoring was honoured before the match. Former Real Madrid star played a key role in setting up Juve’s third goal. Ronaldo rattled the woodwork at the end of a first half that was followed by a far-less interesting second period, with the Portuguese setting up Juan Cuadrado for a late third. Paulo Dybala’s strike inside the opening minute set Juventus on course for their 10th win of the Serie A campaign, although Cagliari made things uncomfortable for Massimiliano Allegri’s men. After seeing nearest rivals Inter Milan romp to victory against Genoa earlier in the day, the Bianconeri restored their six-point cushion at the top of the standings with a 3-1 triumph at the Allianz Stadium. Juventus got off to the dream start as Dybala struck inside the opening minute, but Cagliari came back into proceedings and leveled superbly through Joao Pedro. However Filip Bradaric turned a Douglas Costa cross past his own keeper two minutes later.